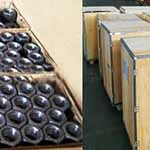 Nickel Alloy Nuts, ASTM B160 Nickel Nut, Nickel Bolt, Nickel Alloy Bolt, Nickel Alloy Shoulder Nuts, Nickel Bolt/Nut Suppliers and Exporters in Mumbai, India. Nickel Alloy Square Bolt/Nut, Suppliers of ASTM B160 Nickel Hex Head Bolt, Nickel Alloy Coupling Nut Exporter, Nickel Bolt/Nut Manufacturer in India. Ganpat Industrial Corporation offers an extensive collection of Nickel Alloy Fasteners (Bolts / Nuts), which is available in different sizes and shapes to market leading prices to our patrons. We as well offer these products in different grades such as Nickel Fasteners (Bolts / Nuts) & Nickel Fasteners (Bolts / Nuts) in customized sizes, shapes and designs to our esteemed clients. 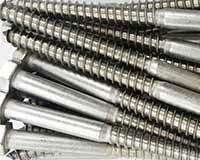 About half of the nickel content of Nickel Hex Head Bolts will have come from recycled sources. Nickel Hex Head Nuts may be strand – annealed at temperatures between 1600 Degree F and 1900 Degree F (870 Degree C and 1040 Degree C) from 5 – 10 minutes down to a few seconds in the hot zone. Nickel Square Bolts is sued in electronic components, along with in applications where spinning to form the product is especially desired. Machinability of Nickel Square Nuts is basically the same as for Nickel 200, where chemical corrosion resistance is in caustic solutions. Nickel Eye Bolts is softer and “gummy” but can be readily machined by conventional mean, where high – speed – steel tools are recommended. Annealing of Nickel Eye Nuts should be done at 1650 Degree F to 1300 Degree F depending upon the degree of cold working and time at temperature. The grain structure forms when a sufficient quantity of nickel is added to Nickel U-Bolts (eight to ten percent in a standard 304 stainless steel alloy). Nickel wing Nut, Nickel Alloy Lag Bolt, Nickel Lock Nut, Nickel Alloy U Bolt, Nickel Alloy Eye bolts, Nickel T Bolt, Nickel Alloy Panel Nut, Nickel Alloy Counter sunk Bolt Manufacturer in Mumbai, India. Al Jubail, Faridabad, Kanpur, Caracas, Sharjah, Pune, Bangkok, Singapore, Nagpur, Haryana, Abu Dhabi, Jeddah, Muscat, Howrah, Thane, Chennai, Kuala Lumpur, Jaipur, Hong Kong, Thiruvananthapuram, Colombo, Brisbane, Istanbul, Montreal, Bogota, Kolkata, La Victoria, Karachi, Manama, Santiago, Cairo, Vadodara, Geoje-si, Bengaluru, Nashik, Jamshedpur, Madrid, Aberdeen, Toronto, Vung Tau, Busan, Chandigarh, Coimbatore, Melbourne, Indore, Riyadh, Surat, Secunderabad, Dallas, Gurgaon, Atyrau, Baroda, Rajkot, Navi Mumbai, Chiyoda, Doha, Hanoi, Courbevoie, Ludhiana, Ankara, Al Khobar, Bhopal, Dubai, Edmonton, Los Angeles, Ho Chi Minh City, Sydney, Lagos, Hyderabad, Mumbai, London, New York, Lahore, Calgary, Milan, Rio de Janeiro, Pimpri-Chinchwad, Dammam, Kuwait City, Ernakulam, Jakarta, Noida, Granada, Gimhae-si, Moscow, Petaling Jaya, Port-of-Spain, Mexico City, Tehran, Ahmedabad, Algiers, Ranchi, Seoul, Perth, Ulsan, Visakhapatnam, Ahvaz, New Delhi, Houston. China, Indonesia, Vietnam, Mexico, Libya, Nigeria, Israel, Argentina, Philippines, Bulgaria, South Africa, Costa Rica, Austria, Qatar, Peru, Canada, Angola, Gabon, Belarus, Gambia, Romania, Ukraine, Yemen, Denmark, Singapore, Italy, Iran, France, Jordan, Malaysia, Switzerland, Bahrain, Thailand, Belgium, Puerto Rico, India, Azerbaijan, United Arab Emirates, Ireland, Kenya, Nigeria, Norway, Czech Republic, Lebanon, Brazil, Netherlands, Zimbabwe, New Zealand, Ghana, Nepal, Hungary, Japan, Egypt, United Kingdom, Pakistan, Iran, Iraq, Greece, Serbia, Mexico, Turkey, Lithuania, Bolivia, Bangladesh, Namibia, Saudi Arabia, Kuwait, Germany, Slovakia, Bhutan, Finland, Chile, Chile, Taiwan, Poland, Sweden, Russia, Estonia, Algeria, Macau, Trinidad & Tobago,Tunisia, Croatia, Morocco, Sri Lanka, Poland, Colombia, United States, Mongolia, Tibet, Hong Kong, South Korea, Ecuador, Portugal, Oman, Afghanistan, Spain, Australia, Venezuela, Kazakhstan.